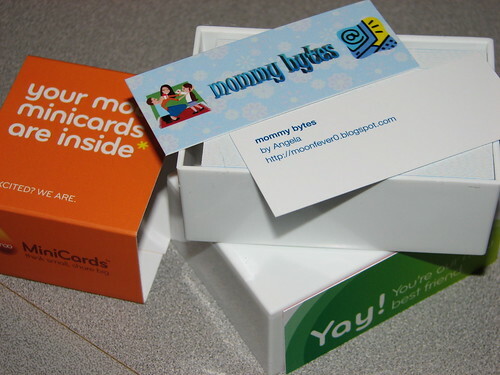 mommy bytes: My Moo cards are here! Ever since I saw these Moo mini-cards, I just had to have them. The size is so cute and the card stock is really nice and heavy. I was in the process of picking 100 photos, but it was so hard to individually crop them all (of course I need to have TOTAL control), so I ended up getting some blog promotion cards instead. All my friends will be getting some (you know who you are!). If you want some mailed, just contactify me. Wait, did the postage rate go up already? Well as long as I can afford it, I'll mail them out. Boy, you are a BLOG marketing machine! Before you know it you will be quitting the day job and selling your BLOG for "millions of $"! I like those little cards. A friend of mine (I'll call him Dave...because that IS his name) brought a set of these to a meet-up one night. He had a random bunch of his FLICR photos on his. I saw the cards info at their website. Nice designs and reasonably cheap.